So, Why Doesn’t the World Know it? I’m fortunate enough to do what I love and love what I do. I’ve spent my entire adult life loving food, wine and travel. As a result, I own four restaurants in Ontario and travel the world learning about wine and food on a global TV show I host called Wine Portfolio. Wine Portfolio launched on CNBC World and now is on several other channels. And yes, without question I feel very lucky being able to do what I do. I do, however, have one complaint, and it’s this: every time I return from a country showcasing great Chefs and restaurants, I am reminded of how underrated Toronto is on the world food stage. Toronto has grown when it comes to truly delicious food experiences, but we definitely aren’t getting the notoriety on this that we should be. Where do I start? For this particular rant, I’m going to focus south of King. This is, after all, Waterfront Magazine. It’s important to note that as this crazy star-struck era of food continues to grow, it has also changed and matured. In the beginning of the upward trajectory in food experience popularity, many chefs were trying to be all things to all people. EVERYONE was “nose to tail” and “sustainable” while wearing a ball cap and being covered in tattoos (or something along these lines); all good things, and don’t get me wrong, I LOVE these places, but there is always more in the food community. The fact is, for a market to be competitive and sustainable it must be diverse and interesting. Food as a passion or hobby remains intriguing because it is constantly growing and changing. Toronto has some great examples from Suser Lee, Lynn Crawford and Mark McKuen, who continue to thrive and re-invent themselves in interesting ways to first generation Canadian Rob Gentile and his open-style kitchens where women flock to see his square jaw and great cooking in action. But there is SO MUCH MORE going on in the downtown core of Toronto. Vegan to meat lovers, food truck to fine dining, tapas to sharing plates and pretty much everything in between, this area of Toronto has a food scene that stands up on the world stage! It’s smart to explore what these other areas in Toronto have to offer. Hot areas are hot for a reason, but this can quickly become boring; exploring is so much more interesting! Like many gastronomic destinations, Toronto DOES know that craft beer and sustainable seafood are not new trends; that color on the plate (today it’s purple), everything Portugal and all things on tap are hot (but who cares? Eat and try everything, on balance, the trends can change in five minutes). For example, Oyshi Sushi bar has amazing sashimi; as a restaurateur I’m thrilled at the quality of fish I’m able to source these days. You’ll also find incredibly healthy fare at Against the Grain Urban Tavern. 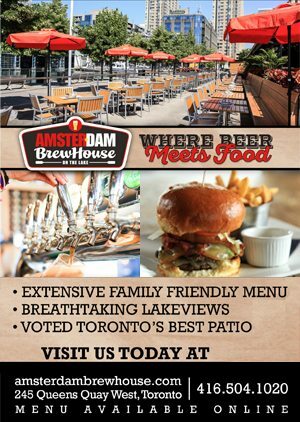 If you haven’t FOUND Against the Grain yet, it’s hidden on the waterside of the Corus Entertainment building, with one of the best waterfront patios in the city. I almost feel guilty recommending individual places, because the choices are vast and I absolutely will miss many. Pearl Harbourfront not only has a great name, they make a mean har gow served up with their awesome Dim Sum. The Slip is great for cocktails and you can’t beat the beer battered fish at the Amsterdam BrewHouse. A short walk up Yonge and around the corner on Wellington, Pravda Vodka bar offers a cool Russian vibe and great happy hour. 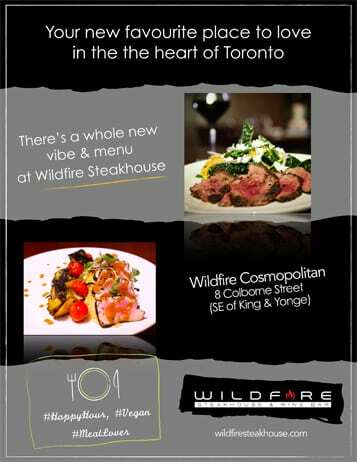 Which can also be found at Wildfire Steakhouse & Wine Bar; the happy hour, not the Russian Vibe! Happy hours are a great way to try a place out, and there are plenty around, including mine! I’m lucky to be situated among these cool picks and serving my food to the eclectic and interesting demographic that is those that live in the local core. My point is, this area of the city has a sophisticated and deliciously international vibe. And don’t even get me started on the waterfront food festivals, (make sure you check out the Hot & Spicy Fest and the Veg Fest, yes, I’m a steakhouse owner and I said this, I also serve vegan). What I’d like to know is why the rest of the world is not catching on? I was recently in Portugal talking to a Michelin starred chef about the fantastic variety of eats in Toronto. He says he’s coming next year! Am I a lone tree in this forest? Where is Toronto Tourism on this? WHY are we not promoting ourselves as not only the most diverse city in the world (look it up) but also a city of fantastic, diverse food? Is it a polite-Canadian thing? A marketing thing? Why does the world not know more about the food scene here? Because, take it from a guy that’s talked food and wine in over twenty countries: it’s very good, and they really should. Toronto Island Sailing Club (TISC) — the waterfront’s best-kept secret!